Vocations Afternoon: Is the Lord calling you to the Priesthood? 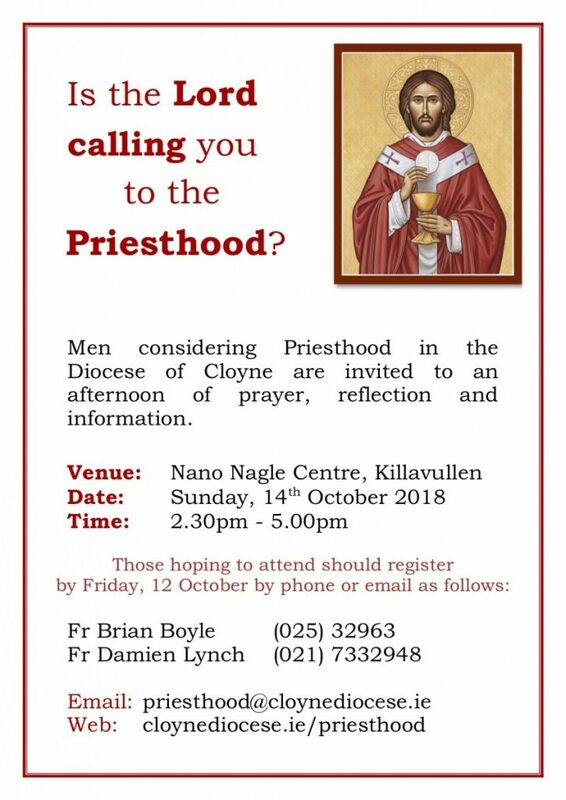 An afternoon for men considering a vocation to the Priesthood in the Diocese of Cloyne will be held on Sunday, 14th October at the Nano Nagle Centre, Killavullen, from 2.30pm-5.00pm. The afternoon will consist of reflection, prayer and the opportunity to find out more about becoming a priest in our diocese. For more information Fr Brian Boyle (Vocations Director) at 025 32963 or Fr Damien Lynch (Assistant Vocations Director) at 021-7332948. Email: priesthood@nullcloynediocese.ie. Those hoping to attend should make contact by phone or email by Friday, 12 October. This Autumn two men have begun training for the priesthood in our diocese. to teach and sanctify your people. that they may answer your call generously. by prayer and good example. and ardent servants of the Gospel. chun iad a theagasc agus a naomhú. chun go bhfregaireoidís do ghlaoch go croíúil. le h-urnaí agus le dea-shampla. agus a freastalóidh go díograsach ar do Shoiscéal. We pray for vocations to the priesthood in our diocese, that those whom the Lord is calling may answer generously. Lord, hear us. For the men God is calling to serve Him as priests in our diocese. That they and their families may be open to His plan and generous in their response. Lord, hear us. That God may raise up young men from our parish to serve in the priesthood, and that they may answer His call. Lord, hear us. That the homes of our parish may be places where vocations to the Priesthood are fostered and encouraged. Lord, hear us.